The journey we all take into finding our own identity is a challenging one. We all want to be what we were told we were as children - special. The society that we live in isn't always embracive of those that can't easily be placed in a box. That can make the process of exposing one's own individuality quite a bit harder. We sometimes end up being the people that we think others want us to be; we stifle our self-expression for what we perceive will be the comfort of others. That's nothing to speak of our own growing discomfort. Sometimes that can be the benefit of the entertainment world; television, film, music and its stars. It's in that world that we see artists whom we revere and who by nature have come to embrace their inner weird. Take Criminal Minds star, Kirsten Vangsness, as a prime example. 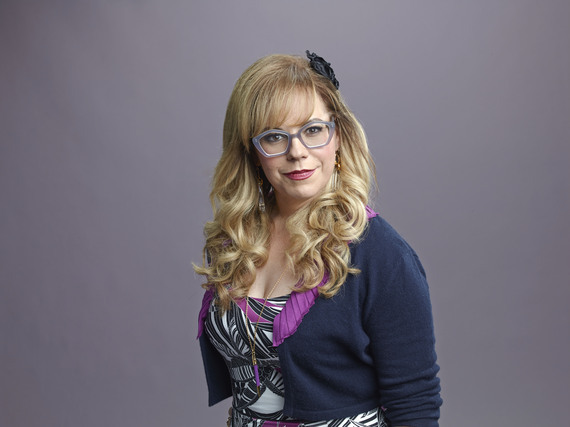 Her portrayal of Penelope Garcia is one that viewers can watch, be entertained, and see a character who not only embraces her inner weird; but is also portrayed by a woman who has embraced her inner weird. Our takeaway: A three-dimensional character (a rarity in today's network television landscape) who's fun, intelligent, entertaining, and relatable. In an engaging phone conversation, Kirsten and I chat about her world in front of and behind the camera, her selflessness in various forms, her commitment to helping support other members of the LGBT community, and how she came to embrace her inner weird. Hello, so good to meet you, thanks for taking the time to talk to me today. So, what's your day looking like today, Kirsten? Well, I just finished working out, now I'm walking back to get my car - I'm getting the oil changed. I know I don't sound like I usually work out, I usually just get my workout from unicorn riding. Can you tell me where to find one? I'm with that if it gets results. More results, less work - that's what I want. I just pretend that I'm riding a unicorn as I go through my various states of denial; and while I'm doing deadlifts. It's nice to see that you're in chill mode today, outside of your role in Criminal Minds, you have a lot going on. At the same time I'm shooting Criminal Minds, I'm producing a movie, doing a play, writing a script for Criminal Minds, writing another script for something else, and I'm usually doing something in theatre. You have such a cool role on the show. Penelope gets to sit there in her domain and be the backbone of the agents out in the field. You get to geek out while all of us technophiles are rooting for you every week. Thank you, Bryan. That makes me feel good. I want to do the technophiles justice. If I don't understand something that, I'll reason in my mind so that way when it comes out it'll look like I understand it. That's hilarious. 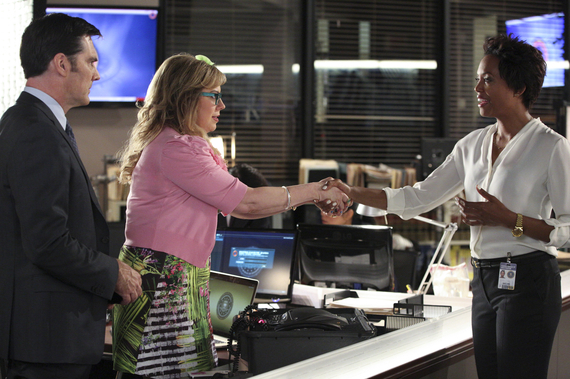 So, is it safe to say that you aren't as tech-savvy as Penelope is? No, not at all. Just, no. I can't even stress enough how little I know. I tell people all the time that I have a degree in theatre which makes me look like I know more than I actually do tech-wise. I'm still trying to work on my typing skills. I'm starting to feel strange about the typing. Someone on Twitter apparently noticed that Penelope types with a pen in her hand; they tried doing it themselves and it's not possible. They were mad that she was doing it as though it were a thing - she's mythical. Wow, isn't it amazing how much people pay attention to the smallest things? In any case, I worked in a bank for years, it's challenging to type with a pen in your hand, but not impossible. I believe that Penelope can do it. This is true, Penelope can achieve all things. She's got it like that. How have you evolved her as a character over the years? My sense is that she has gotten more relaxed over the years. I want to say that she maybe has developed a thicker skin in order to be able to keep doing the job that she does. Penelope has definitely gotten more comfortable in her own skin - she's a sensitive empath. The writers have made the suggestion that she should harden up a bit more, I don't think that she has chosen to harden up. I'm sure I speak for the fans as well, I like the fact that Penelope hasn't hardened, and she's still a very relatable character. Much like the woman who portrays her, she embraces her inner-weird, and as a result has developed her own way of a coping. I understand that Penelope, as though she were a real person, has a Twitter account with over a 100,000 followers. It's the strangest thing. I don't think about it much. The writers write her tweets, but they allow me to see it first to see if it sounds like something she would say. As we mentioned earlier, you've got a truly full plate; some of that is due to you being able to pursue your love of the theatre. What can you tell us about that? Theatre of Note is a company of actors and we have a regular season, we're doing a show right now. I'm producing a play and I'm also in it. Sometimes my ability to do a play is contingent on whether or not I'm needed on the set that day - but, I should be able to do this play. Sometimes, I feel like I do all of these extra things so that I can encourage people to come and see these plays. There are so many talented and hardworking actors out there. Theatre is hard work, you mentioned that you were making a movie as well, that's exciting, congratulations! It's called me Kill Me, Deadly. We finished it about a year and a half ago and it just got distribution - it's going to be at the Noir Festival in Paris. I'm super excited about it. I got to do it with a bunch of theatre nerds, as well as some of the good people in my other life are also in it; Joe Mantegna and Shemar Moore in it, and Paget Brewster plays a small background character. Just hearing the excitement in your voice is making me want to see it even more, plus I love period noir pieces. I produced it myself. It's a big fancy love letter to Hollywood. We filmed it in Hollywood, it was very, very expensive because we did things right and by the book. It was expensive because we paid everybody the living wage. I just didn't feel fair saying that everyone should work for peanuts. Do you prefer theatre to television or film? I love theatre, I love film and television as well. I love to make things, and most of all I love communities that come together to make things. There are differences between television/film and theatre, the camera vs. the audience; is there a different approach to the two? It's really in the eye of the beholder. I've always felt that I'm too broad for television. My experience has always been that if you're in a room with 500 people, your body will adjust. It's just like the way your body will adjust if it's the opposite situation and there's a camera in your face. Your job as an artist is to make sure that your body will adjust to the demands of your job. Outside of show biz, I've heard that you have some news in another area of business. Anything exciting? My friends and I just broke ground on a craft distillery that I'm going to be a co-owner of. It'll be in Santa Ana - yes, I'm an Orange County girl. I went to school there. It's called The Blinking Owl. Lemonade Stand Support for children with cancer and Project Angel Food, you also support another more personal cause to you; GLSEN (Gay, Lesbian, & Straight Education Network). It's a wonderful support system for queer kids, being one myself, I feel very passionately about it. I was openly in a relationship with a woman for 6 years, and we were in love. At that time, I completely identified with being a lesbian. We've since broken up, and here I am four years later - I'm completely in love with a dude. I guess the reason I'm more passionate about it is because it can be so hard, people arrive in so many different ways - especially when you're a kid. Our society wants you to be in a box, but when it tries to force you into one... You might go hog wild. I feel like a teenager in that respect at times, I can relate to what they are feeling. That's a very beautiful thing that you're doing, Kirsten. I wanted to expound a bit on your point about being in a box. As an artist, your natural instinct is to think and therefore exist outside of the box. However, it's interesting - when you don't fit into the box in our society, you're persecuted. Yeah, exactly. I've always been a weirdo. I believe everyone is a weirdo, but then when you're more forthright about it you end up in the weird box. The reality of the human condition is that we're fluid, and that's a beautiful thing. That means that we can always change for the better. It also means that we can always evolve, there's always room for improvement, and that none of us needs to be written off because on a dime something can change into something else.